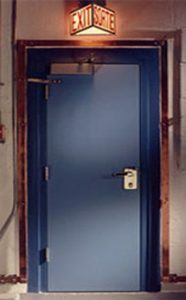 Blast Resistant Doors Protect People And Property From Danger, Including Explosions And Shrapnel. In Fact, Shrapnel Causes More Damage Than The Initial Blast Itself. Any Property That’s Properly Equipped With Blast Resistant Doors Can, Unquestionably, Save Lives. Blast Resistant Steel Doors And Frames Combine Blast And Air Pressure Resistance And Yet Function Similarly To Standard Hollow Metal Products. Our Entire Range Of Blast Resistant Products Are Readily Available Complete With Builders Hardware That Provides An Easy-To-Operate Door System. What Types Of Miami-Area Facilities Have Installed Blast Resistant Doors? If You Have Valuable Assets Inside Your Building (And Who Doesn’t? ), Then Your Better Off Playing It Safe With These Durable Steel Commercial Doors. Best Brothers Group Is One Of The Most Trusted Names In Steel Commercial Doors And Hardware. Our Blast Resistant Steel Doors Are Available With Pre-Installed Factory Glazing, And Have Been Tested By Independent Laboratories That Comply With The Most Up-To-Date Standards In The Market. The People And Property Inside Your Facility Are Irreplaceable. You Can Eliminate The Potential Of Massive Damage And Casualties By Installing High-Quality Blast Resistant Doors Into Your Facility. All Of Our Doors Come Complete With Builders’ Hardware, Which Provides An Easy-To-Operate Door System. Our Customer Service Representatives Will Work Closely With You To Determine Which Type Of Blast Resistant Product You Need For Your Facility. We Will Assess Your Location, Foot Traffic, Current Aesthetics, Type Of Property, And More In Determining The Ideal Product For You. Contact Us Today To Learn More About How We Can Help You And Your Project.